A big disappointment for me several years ago was seeing reading evangelist Neil Gaiman talk to a room full of librarians about the power of reading. I had read the transcript several months earlier and in my head I had a powerful, expressive voice driving home the importance of reading. Watching the video, I was crestfallen (and a tad bored). It was all very English and dignified, it was a measured speech completely lacking in any emotion. Some may say that this is how professional, mature people behave when delivering a speech to a room full of other professionals (and they might actually be right). However, I feel that reading discussions need to have more passion. I want to hear indignation and conviction and go all “Captain, my Captain” over the written words that have impacted my life. At times, being measured in our responses means that our reading has not stirred us, it has not incensed us enough to be overcome with emotion, we have not lost ourselves in a moment of passionate defense where we would rather risk offending another person by remonstrating the merits of words that reach into your soul. Writing that leaves me unmoved, dispassionate, bored and filled with ennui does not interest me. I seek out the books that fill my mind with fireworks and give me cause to shout out in their defense. And how could I not defend Julia Quinn’s latest romance! How could I not feel riled at the suggestion that romance fiction is not a place to grapple with serious issues and that it is reading that does not get absorbed in the mind. 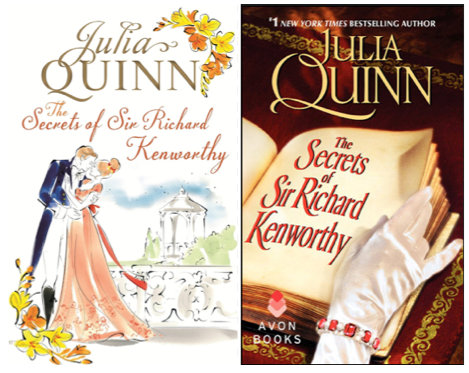 Quinn’s latest novel, The Secrets of Sir Richard Kenworthy, is part of the Smythe-Smith series. I was pleasantly surprised by Iris Smythe-Smith’s courtship story. Sir Richard Kenworthy who has travelled from Yorkshire to London to find a wife as he needs to be married within two weeks. Iris, is intelligent and suspicious of his courtship yet still marries him in the short time that he needed. The two travel back to his home and spend a fortnight without his sisters there. During the first half of this book, the focus is on this growing relationship. You see genuine friendship and deep desire growing between these two people. However, Richard refuses to consummate his marriage and this leaves Iris confused and devastated. Eventually, when Richard’s sisters arrive back home she discovers his reason for not consummating their marriage and the book goes from a lightweight, fun read to one that poses questions about shame, brotherly duties, anger, deception, class and women’s status in Regency society. In true Quinn fashion, her writing remains focused on the love resolution yet her weaving of serious issues with a light pen at no point becomes flippant. I think it is this light pen that misdirects many readers who are unsure of where to position romance fiction or just consider romance fiction to be interchangeable and throwaway pulp reading. I think much of this attitude comes from the lack of broader, scholarly understanding of how romance fiction fits in the greater literary field of discussion. The literary world is used to serious books dealing with serious issues and consistently rewards them. But it rarely rewards comedy, of which romance fiction is a subgenre, even though it has always been an instrument through which to openly debate on societal concerns from Aristophanes’ Lysistrata, Shakespeare’s Much Ado About Nothing to Jon Stewart’s The Daily Show. I’m not wholly convinced that this one novel is worthy of such passion. I would not call it Julia Quinn’s best novel (it does not come close to the wonderful When He Was Wicked). But it was definitely a read that moved me, adds value to Quinn’s ouevre and merits discussion. Perhaps it is my Greek DNA that relishes in public arguments, on debating contentious ideas. My friend, who dissed my choice of book/format, also has Greek DNA and I know that she too is fearless in insisting that her view is the right view *cough she is wrong cough* because when it comes down to it, the two of us have been engaging in loud arguments for over 25 years and in the same breath we will have another coffee, a kourabieda on the side, and life will calm down again until we find another point to argue over. I have the same arguments with my very close friend also. ‘Romance has no merit’ ‘there is no talent in romance’ etc etc. It makes me so angry and I tend to jump to the bait like you do however Romance is wonderful. Romance is often well written and composed and is deserving of every merit it achieves. I also love Julia Quinn, she started my historical romance obsession and for that I will be forever thankful for the day I picked her book up in a Greek book store! As much as I loved contemporary romance, I could not get into historical romance until I discovered Julia Quinn so how could I not defend her! I’m assuming you found her book while on holiday in Greece? I love discovering favourite reads while overseas! I actually followed a link from Julia Quinn’s Facebook page to your blog. I can’t say I’m a huge romance reader (anymore – I’ve had to limit my fiction reading due to how busy I’ve been with grad school) but JQ is one of about 4 romance authors I consistently enjoy and therefore I follow her work even when I’m not reading it. Anyway, I just wanted to let you know that I love this post! I completely agree with your position regarding literature that excites you! As a recovering english major and a trained (but not practicing) librarian I have always felt that reading should be based on what actually interest the reader rather than what ‘should be read.’ Romance as a genre seems to be coming more and more into its own (see the recent segment by the podcast “Pop-culture Happy Hour” and any number of websites in support of the genre) and I couldn’t be happier! I also have to say as an aside that despite any aesthetic disputes people may have with romance novels, I attribute any skill I have with writing to first being a voracious reader. If genre fiction is what gets people reading then it has merit. Period. If the genre in question is well edited and well written (like JQ’s), all the better. 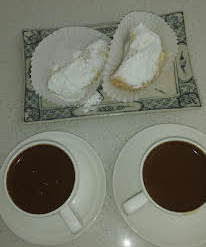 Also, I totally wish I were in Greece right now, and I am jealous of your coffee and pastries 😉 Kalispera! I wish I was in Greece too! My sister is there at the moment and she keeps posting island shots, filling me with envy. I love that you say “recovering English major”. It is as if being taught canon and criticism is an affliction. As a librarian (and now library scholar), I’m always surprised at how romance reading can polarise so many people. Even in libraries with newly graduated staff, I have heard some eyebrow raising judgements being passed on the readers. Have you read Catherine Sheldrick Ross’s “Reader on Top” – or any of her scholarship on avid readers? I highly recommend her. Only consider, if Jane Austen were writing contemporary romance today she would almost certainly be published by Harlequin. I LOVE Julia Quinn!! Her books are thoughtful, emotional and best of all funny.